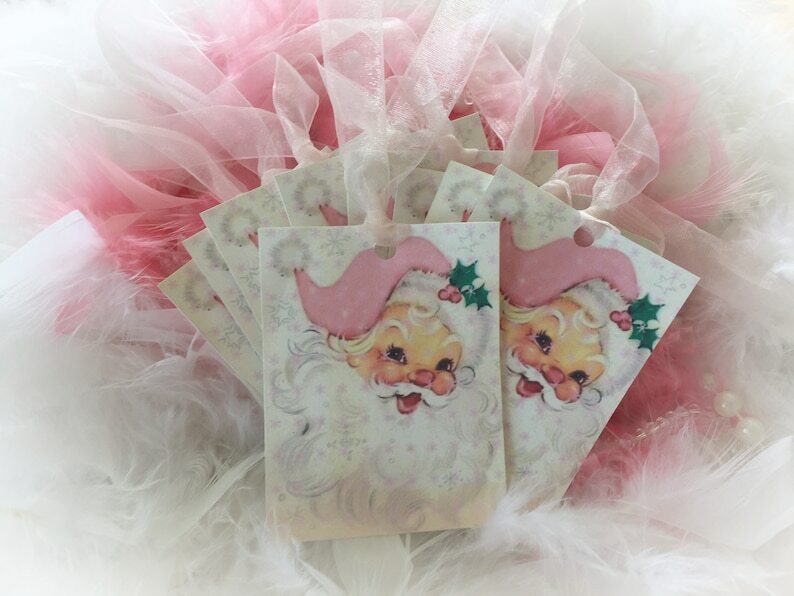 Description: This is for 9 really sweet and a bit kitschy 1950's vintage style beautiful Christmas pink Santa Claus tags with 9 sheer organza or satin (depending on my stock) ribbons. Printed on high quality cardstock, and blank on the back for your personalized greeting. You can also tie these on your Christmas tree and use them as tree ornaments! Specializing in: shabby chic, Victorian romantic style, vintage retro inspired, interior home decor, office decor, nursery decor, art, rustic decor, cottage chic, farmhouse, handmade, handcrafted, hand painted, decoupage, altered art, altered cans and jars, gift ideas, vintage lingerie, boudoir items, wedding centerpieces, handpainted painted mason jars, upcycled repurposed tin cans, wedding decor, Victorian style items, DIY, scrapbooks, journals, ephemera, junk journals, smash journals, destash items, Day of the Dead decor, Día de los Muerto and so much more! DELIGHTFUL Pretty PINK Santa Tags!! Just LOVE them! 💗💗💗💗 These were a BIG HIT with the Women this year at Christmas. Many of my Family/Friends ended up hanging them up on their Trees and they looked AWESOME! High Quality Cardstock with Clear Print Design and High Quality Shimmery Pink Ribbon added. Great Shoppe Find and Great Prices for High Quality. Highly recommended 100%! Santa Claus is always a favorite. All the tags I ordered are simply wonderful! Pink Santa Claus, Deer, Tree and the wonderful ribbon that is attached to each of them. What a HAPPY tree I will have!